Madurai Veeran is worshipped and has ardent devotees in the villages of Tamil Nadu. In Aiyannar and Amman temples, Madurai Veeran is often an important powerful deity. The story of Madurai Veeran is depicted in Madurai Veeran Ammanai. It is widely believed that Madurai Veeran was born as the son of the king of Kasi but was left in the forest because he was born with a garland. He was then brought up by the Sakiliya community. He grew up a brave man, doing good to his people and married the Pomanna Naykar' daughter, Bommi. Madurai Veeran worked for a king, Thirichrapalli Vijayananga Sockalingam for a thousand gold coins. He was asked to solve the problem of theft that was worsening in some parts of the kingdom of Thirumulai Nayakkar. During this period, Madurai Veeran meets and married Vellaiyama, who was one of the Thirumalai Nayyakar's assistants. Incensed, Thirumalai Nayyakar order for Madurai Veeran's sanctum is now found in the Meenatchi Amman's temple and is received for bringing an end to the problems caused by robbers. The practice of worshipping Madurai Veeran is believed to have commenced during the period of Niackers. 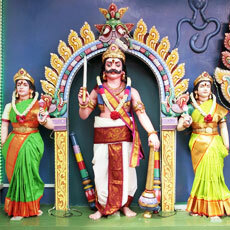 Madurai Veeran is seen to have put an end to the several problems caused by the robbers in the Madurai Area. Madurai Veeran is also known to be called Karrupswamy and Pathinettam Padi Karuppan by some devotees.